It’s being called a “transformational” change, and for once that’s no exaggeration. If Toronto had the power to require developers to build more low-income housing, it could have seen 12,000 new affordable units built in the past five years. Instead, fewer than 3,700 were put in place. Now Toronto and other cities across Ontario are poised to receive precisely such power. The development industry isn’t happy, but the move by Queen’s Park marks an essential shift in the provision of affordable housing. It was a long time coming. The change, called “inclusionary zoning,” had been sought for more than a decade by urban advocates and anti-poverty activists. Its provisions would enable cities to demand that developers working on major residential projects set aside a percentage of units for low-income people. There would be no choice. Making allowance for society’s less-fortunate would become a required cost of doing business. The system is widely used in the United States and works best in cities where a thriving real estate market assures developers of a strong return — in other words, in places just like Toronto. The measure isn’t entirely one-sided. In return for creating set-asides for affordable housing, builders can be granted more favourable density allowances, fast-tracked approvals, fee reductions, or some combination of benefits helping to off-set their forgone profit. It’s vital that action be taken. Ontario’s waiting list for affordable housing hit a record high last year, with more than 168,000 households needing such shelter. 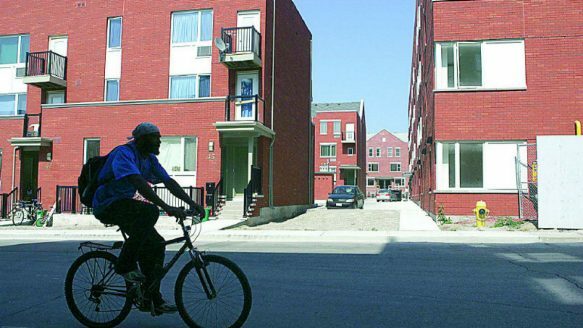 Various private member’s bills have attempted to bring about reform, but a breakthrough came Monday with Ontario announcing an updated affordable housing strategy. As reported by the Star’s Laurie Monsebraaten over the weekend, the centre-piece of that plan is inclusionary zoning for municipalities that want this power. Ontario Municipal Affairs Minister Ted McMeekin described the new package as “transformational.” The same word was used by Toronto chief planner Jennifer Keesmaat last spring in describing the impact of inclusionary zoning. She told a community forum that Toronto could have created 12,000 new affordable homes over just five years, with a provision requiring 10 per cent of new units to be set aside for lower income people, in every project with more than 300 units. That’s an excellent indicator of this strategy’s potential. But a considerable distance remains to be travelled before inclusionary zoning becomes a reality. Ontario is now consulting with municipalities, developers and others on how necessary legislation should be framed. McMeekin has said he wants the measure passed by early June, before the legislature’s summer break. That’s a reasonable goal. The rules should allow for flexibility. Not every city’s situation is the same. Within broad guidelines, municipalities should be allowed to set their own required percentages for low-income housing along with off-sets for developers. It doesn’t make economic sense to apply this system to small residential projects, but cities can decide how big a development should be before inclusionary zoning provisions kick in. Municipal officials know what works best in their jurisdiction and the province should avoid micromanaging this essential reform. Affordable housing is desperately needed and there’s a strategy at hand that could make a difference to thousands of low-income families. It’s important to move quickly and free these people from a waiting list that only seems to grow ever longer.